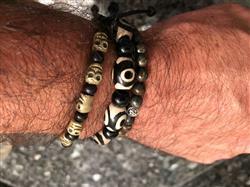 This bold wrist mala is made of heavier brass skulls and dark wood beads on adjustable cord. The contrast makes for a simple and attractive design that looks great worn on it's own or in a stack of your favorite bracelets and malas. Adjustable wrist mala can fit wrists from 6 to 9 inches around. Contains 13 brass skulls and 16 wood beads, including the toggle beads. Handmade in Kathmandu, Nepal. I absolutely love this mala. I saw it and said that this wrist mala will match my Bone and Skull neck mala, so yeah it was an easy choice for me. It was a little tight at first, but after a week it loosened up a bit and now I barely notice that I’m wearing it except for when it catches my eye and I’m always admiring it. The picture does not do this mala justice.The brass is a beautiful color and the craftsmanship is outstanding. Everything that I have purchased from Dharmashop is of the same exquisite quality. I highly recommend any of the products that they sell. Whats worse???? Let me tell you. I had just ordered a Naga shell Om bracelet and a Sprit lava and Mastadon wrist mala for myself, and a lava rock wrist mala for my wife when I got the request to write a review on this product only to see the Calming Onyx and Budda wrist Mala with a red cord featured. Looks like another purchase is in my future. Thank You Dharmashop I love you, but my wallet is of a different opinion…….. Wear it all the time. Nice quality! No complaints. Hello Donald, thank you for taking the time to write this review! We are so happy to hear you are enjoying your Brass Skull Wrist Mala, and we appreciate your support in Himalayan artisans! Bought a while ago; it lasted a few years before the string finally broke. I was able to save all the skulls and beads ;). I realized how much I missed having it on my wrist so I finally bought another. Great quality and fit. Definitely recommend! Matt, thank you for taking the time to write a review. We're glad to hear that the first wrist mala lasted quite a while for you and that you liked it so much you bought another one! We hope that it continues to serve as a nice reminder for you and that this one lasts you even longer! Thanks again for your feedback and continued support. The bracelet is well made and good looking. 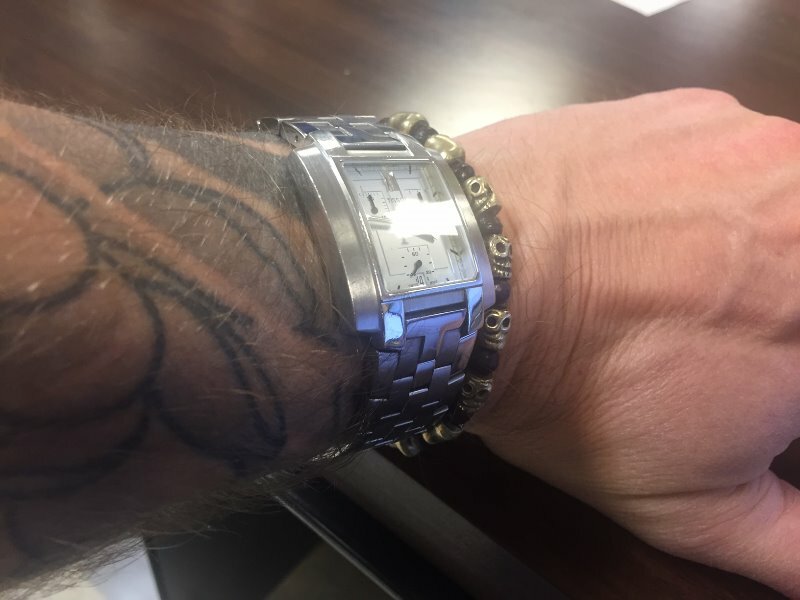 I think it is a little thin for a man’s wrist, so I usually wear it paired with another bracelet. The thing to be cautious of is fitting it over your hand. I have an 8.25” wrist, and it is a *very* tight fit over my hand. As long as it fits, it is a fine piece. William, thank you for your detailed review. This information will be super helpful for customers purchasing in the future! You're right - this bracelet does look great stacked with other items, and we're glad you're enjoying it. Thanks, again!